Teamviewer released their beta app for android a few days ago and I have to tell you that this application is the best of all the VNC viewers I have used till now. Before you read further I should tell you that this is app is used to view and control your friend’s or your own desktop from your android device, you will not be able to view and control your friends android running Smartphone. This is now just a beta app and your partner to which you are going to connect through teamviewer should have the Teamviewer version 6 Beta installed in the desktop, you will not be able to connect to the host if it is running teamviewer below version 6. The best feature of teamviewer desktop application is that you don’t need to actually install it. If you are going to connect to the host only once for some minor issue then while setup the host just has to select the RUN option in the ‘Welcome to Teamviewer’ dialog box. You can install the application in the host computer if you need to enter the system on a daily basis. Now all you got to do is type the id and password of your partner which is shown in the desktop application of teamviewer to the extreme left and wait for some time till the connect to your partner button brightens up then click on it. Once the connection is successful it will show you a screen with the instructions of how to use the teamviewer and then after reading click on close in the bottom right and then you will be able to use your partner’s computers. You can also enable the ‘Show remote cursor’ option by pressing menu and then going to options. You can also enable the ‘Remove wallpaper ’ for faster use of the host computer in the options menu. 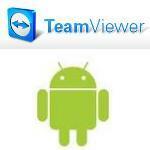 Why is Teamviewer the best VNC app? Well firstly because it’s a free application and lets you do almost anything what you can do on a normal computer. We don’t have to type in the IP address and other such details of the host computer. You can also regenerate the password whenever you want, and it is really smooth, even on my 2g connection I was able to use it pretty smoothly. Though this it is the best application it has some glitches, When prediction is on it sometimes adds extra characters while writing, but when prediction is off, it works well. But this is a minor issue I guess and maybe solved when it comes out of Beta stage,the best aprt of this application is that it’s smooth, easy to use, works well and it is free.